Giving voice to the living tradition of Canadian horse farming and logging. Alberta Carriage Supply’s goal is to provide a one stop shop for teamsters of all size horses, but their specialty is the Draft animal. 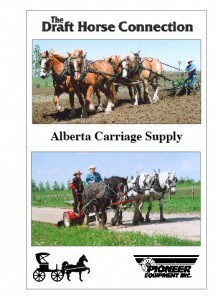 With over 30 years of experience under their belts, 15 as Alberta Carriage Supply, Terry and Dale are happy to provide advice on what has and hasn’t worked for them . How to work and adjust Pioneer Equipment, from the Â Classic Pioneer wagon, walking and riding plows, spring tooth Â harrows with crumbler attachment, forecart, and blade/grader Â attachments. The rope and pulley hitch is setup to show how well this works using a four up hitch of Belgians on the foot lift sulky plow. Proper harness fitting is demonstrated in detail explaining how each piece should fit the horse and the adjustments that are necessary to keep the horse comfortable while working in the field. 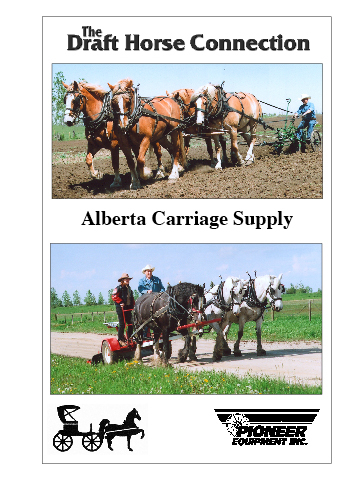 This is a great educational video showing Pioneer Equipment at work, harness fitment and an overview of the inventory of wheelwright supplies, top quality harness, and the complete line of Pioneer Equipment Alberta Carriage Supply keeps in stock.